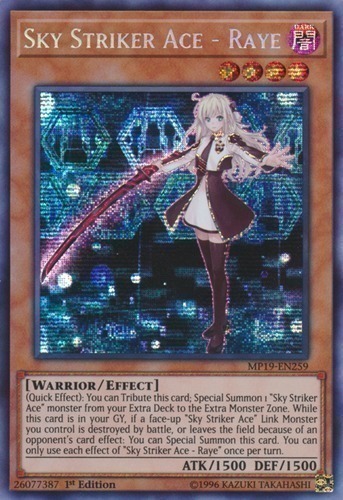 Text You can Tribute this card (Quick Effect): Special Summon 1 "Sky Striker Ace" monster from your Extra Deck to the Extra Monster Zone. While this card is in your GY, if a face-up "Sky Striker Ace" Link Monster you control is destroyed by battle, or leaves the field because of an opponent's card effect: You can Special Summon this card. You can only use each effect of "Sky Striker Ace - Raye" once per turn.